ALL AMERICAN (AUS) (Brown 2005-Stud 2010). 4 wins-3 at 2, VRC Emirates S., Gr.1. Sire of 313 rnrs, 167 wnrs, inc. SW Yankee Rose (ATC Sires' Produce S, Gr.1), Dark Dream, Bachman, Zebulon, America Mon Amie, SP Crockett, Tiger Silk, American Genius, Sam's Image, All Out of Love - Big Truck (Mal. ), Rampage, Tender and of Looks Like Elvis, Phelps Glory, Green Card, Invisible, Lady Trickster, All a Spritz - Beauty Spark (H.K. ), Kaplumpich, etc. Private Lounge (f. by Duporth). 3 wins at 1200m to 2017-18, MRC Le Pine Funerals H., 3d MRC Spicer Thoroughbreds H., Thoroughbred Club H.
Crystal Billy (g. by All American). Winner. See below. Longchamp Belle. 2 wins-1 at 2-at 1200m, A$124,840, VRC Spotless P., 2d MVRC Sportingbet Best Tote Plus P., Eurozone H., City Jeep H., 3d BRC Brisbane Marriott Hotel P., Sale TC Eastcoast Home Timber & Hardware H.
Loose Lion - Collagen (H.K.). 2 wins at 1100m, 1400m in Aust. and HK, HKJC Suisse Programme H., 3d HKJC Helene Mascot H., Happiness H.
Gypsy Jack. 6 wins to 1450m in Aust. Crystal Club. 5 wins. See above. Magic Ocha. Winner at 1250m in Aust. Paris Zero (Danzero). 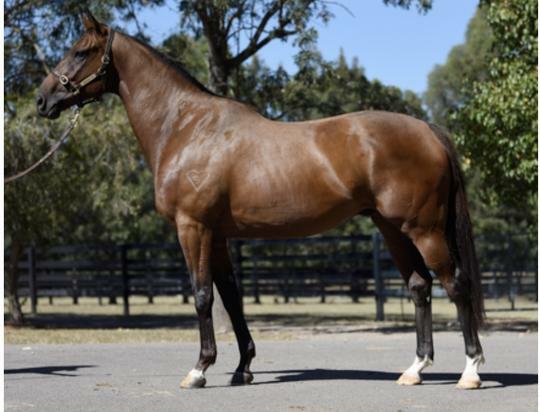 5 wins-2 at 2-at 1200m, 1300m, A$235,425, VRC Cromwell H., MVRC Swift Signs H., Trailer Body Builder Magazine H., MRC Ken Hilton 2YO H., MVRC Jands Production Services 2YO H., 2d VRC Curran Chemicals H., Tasman H., MRC National Jockeys' Memorial P.H., MVRC Melbourne Hunt Club H., St Steven 2YO H., Variety the Children's Charity Cup, 3d MRC Le Tan S., L, 4th VRC Century S., L, MRC Kevin Heffernan S., L, Boronia S., L.
Incarnation. 3 wins to 1400m, A$76,740, AJC Devils Lair H., Citius H., 2d MVRC Specto Security H., STC Paraquad H., 3d STC Konami Maroubra RSL H. Producer. Kabinda (Kenmare). 9 wins to 1200m, A$102,280, QTC Avondale H., Santa Anita H., 2d QTC Lightning H., Gr.3, BATC Orlando Flying H.
Plaza Athenee (Tolomeo). 3 wins-1 at 2-at 1000m, 1200m, AJC Sam Hordern H., MMI Insurance H., STC MacArthur H., 2d STC Birthday Card H., L. Producer. BUDDY BUNDY (Al Maher). 6 wins to 1100m, A$192,500, HK$603,150, SAJC Lightning S., L, Hamilton Holden H., Leader Computers H.
ZARATONE (Zariz). 17 wins to 1300m, A$635,060, ATC Sebring S., Gr.3, Starlight S., L-twice, 2d ATC Carrington S., L, June S., L, 3d ATC June S., L.
EXCELLERATOR (Marscay). Joint second on The 2000-01 Australasian 2YO Classification. 8 wins-5 at 2-from 1000m to 1900m, A$2,228,495, AJC Epsom H., Gr.1, STC Silver Slipper S., Gr.2, Hill S., Gr.2, 2d STC Golden Slipper S., Gr.1, AJC George Main S., Gr.1, Apollo S., Gr.2, STC Peter Pan S., Gr.2, Gloaming S., Gr.2, 3d AJC Galaxy H., Gr.1, VRC Emirates S., Gr.1, AJC Up & Coming S., Gr.2, Expressway S., Gr.2, MVRC Waterford Crystal Mile H., Gr.2. ARTISTIC (Darci Brahma). 4 wins from 1200m to 2400m, NZ$281,175, A$57,400, New Zealand Oaks, Gr.1, ARC Sunline Vase, L, Bonecrusher S., L, 2d BRC Doomben Roses, Gr.3, Hawkes Bay Bay Ford H., 3d WRC Desert Gold S., Gr.3, Marton JC Waikato Stud H., 4th New Zealand One Thousand Guineas, Gr.1, ARC Eight Carat Classic, Gr.2, Waikato RC James & Annie Sarten Memorial S., Gr.3, Cranbourne Cup, L, Gold Coast Bracelet, L. Producer. YALLINGUP (More Than Ready). 3 wins from 1200m to 2000m, A$169,015, AJC Frank Packer P., Gr.3, STC Group One Membership H., Wangaratta Cup, 4th AJC Epsom H., Gr.1. Race Record: 7 Starts 1-0-1 A$21,000.